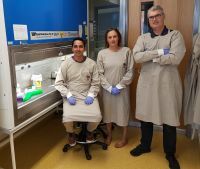 The incidence of tuberculosis in Tasmania can be traced more quickly and efficiently now, thanks to new technology developed by the University of Tasmania for the Royal Hobart Hospital. Whole genome sequencing (WGS), which assists in tracking tuberculosis infections, was previously only accessible interstate but is now being carried out at the University’s College of Health and Medicine. The establishment of an end-to-end workflow for genome sequencing and bioinformatic analyses is a first in Tasmania for the study of human bacterial infections, an advance which saves time and costs. Local WGS has also provided the basis for a joint study involving the first in-depth genetic epidemiological analysis of tuberculosis (TB) in Tasmania using microbial genome sequencing. Recently published in the Public Library of Science (PLOS) ONE journal, the study was completed by investigators from the University’s School of Medicine, Royal Hobart Hospital, Launceston General Hospital, Victoria Infectious Diseases Reference Laboratory and Trinity College in Dublin. The study co-led by School of Medicine researcher Dr Ronan O’Toole was aimed at determining how further spread of the disease might occur and how to limit this in the future. “Whole genome sequencing assists in tracking mycobacterium tuberculosis infections and in detecting antibiotic resistance markers with a reduced turn-around-time,” Dr O’Toole said. Co-author PhD student Sanjay Gautam said the research was also being used on a broader scale. TB is in the spotlight this week as part of World Tuberculosis Day (Saturday, March 24), which aims to raise awareness about the disease and its endemic impact in many parts of the globe. A contagious infection primarily affecting the lungs, TB accounts for the death of approximately 1.7 million people worldwide each year. Every year in Australia more than 1,200 people become ill due to TB, with 20 cases of TB identified in Tasmania since the start of 2016. Co-investigator Dr Louise Cooley of the Royal Hobart Hospital said the WGS technology and the resulting research provided an important basis for a greater understanding of this infection in Tasmania. “The results support the efforts of the RHH and LGH TB services to identify patients at risk of tuberculosis and prevent active infection by antibiotic therapy,” she said. The research received funding from the Royal Hobart Hospital Research Foundation.